Would you like a quote for a print design project? Please email quote@memodesign.co.uk with details and we'll get back to you. 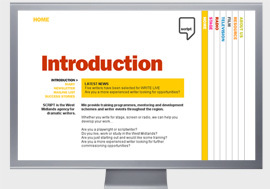 Script are a West Midlands agency for playwrights and scriptwriters, offering advice, workshops and discussions. Poster design to advertise a range of writer workshops. The poster uses bold typography and colours which was part of the branding style that we came up with. The poster idea was to engage the writer by encouraging them to create the missing sections of the script, in other words to fill in the blanks on the poster. Invite design which plays on the word 'invitation' by highlighting appropriate sections linking in with additional information. A postcard design used to promote screenwriting. A simple but striking visual idea. Script: logo and stationery design.